More Vintage Synths Sounds From Five Classic Analog Instruments. New samples from five of the best analog instruments ever produced! Available On CD-ROM as a digital download – $40. USD. The Patch King’s Vintage Synthesizers Volume 2 includes an amazing collection of new sounds from five classic synthesizers. Killer sounds from the ARP2600, Super Jupiter, Prophet-5, Prophet VS and Moog Modular Synths. 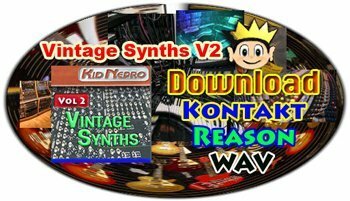 Lot’s of cool basses, leads, pads, strings and analog synth sounds in WAV format, Native Instruments Kontakt and Reason’s NN-XT sample player. Now without having to shell out all that cash for a vintage synth, you can now get the next best thing. Much care was taken to preserve the original sound when sampling the five classic synths. The sound is as close as you get to the real thing. All thrill and no fill!